Persistent gossip suggests that Amazon will launch two Kindle Fire models this year: a new 7-inch model and a larger 9-inch device, the latter presumably designed to compete head-to-head with Apple's iPad, which has a 9.7-inch display. The latest rumor, courtesy of Pacific Crest analyst Chad Bartley, isn't the first to predict a 9-inch Kindle Fire. Digitimes, for instance, reported in November that Amazon was building a larger Kindle Fire with an 8.9-inch screen. If Bartley's sources are correct, Amazon will debut the new Fires by mid-2012, AllThingsD reports. One thing missing from the first-generation Kindle Fire is a camera -- likely a cost-cutting move needed to hit Amazon's aggressive $199 price point. Even without a camera, the Fire is reportedly a loss-leader for Amazon. The color tablet/eReader is designed to route users to Amazon's shopping sites, where the world's largest online retailer recoups its Kindle losses by selling goods and services to Fire-toting shoppers. Until now, the missing camera hasn't been much of an issue. The ability to shoot video and stills isn't high on tablet buyers' must-have lists. The Kindle Fire's most direct competitors, Barnes & Nobles' duo of color tablets, don't have cameras either. The iPad 2's cameras are truly awful, a weakness that Apple will sure rectify in the upcoming iPad 3. And while the latest batch of Android slates, such as the Asus Eee Pad Transformer Prime, have respectable, smartphone-caliber cameras, they've yet to catch on with tablet buyers. So given the camera's secondary status -- in the tablet market, at least -- why should Amazon add one to the Kindle Fire? Because the camera has become an essential shopping tool, and the Fire's purpose -- at least from Amazon's perspective -- is to get consumers to buy more stuff from Amazon. According to a recent Pew Research Center survey, slightly more than half of U.S. adult cell phone owners used their handsets as shopping guides in physical stores during the 2011 holiday season. In a 30-day period before and after Christmas, 25 percent of adult cell users went online to see if they could find a better price for a product they were considering buying. The 7-inch Fire is small enough to function as a shopping assistant, although it's questionable whether consumers will lug along large slates on mall trips. Equipped with a camera, the Fire is a good fit with today's price-matching apps, as well as the next generation of augmented reality (AR) tools that display computer-generated information over a real-world view. Some early AR apps are targeted at shoppers. Amazon's own Flow app, for instance, shows details about everyday products you'll find in stores. 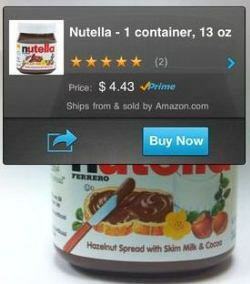 Point your smartphone or tablet camera at, say, a book cover, video game, or DVD; Flow recognizes the item -- as shown in the Nutella example below -- and overlays shopping information from Amazon.com. For the Kindle Fire to evolve as a shopper's companion, it'll need a camera or two. Of course, the new feature will give physical retailers yet another reason to hate Amazon and its price-cutting ways.